PMI Agile Certified Practitioner (PMI-ACP)® is an agile certification carrying weight and credibility for those with some experience in agile methodologies, or those who have worked with a progressive elaboration, phased, or iterative approach to project management. 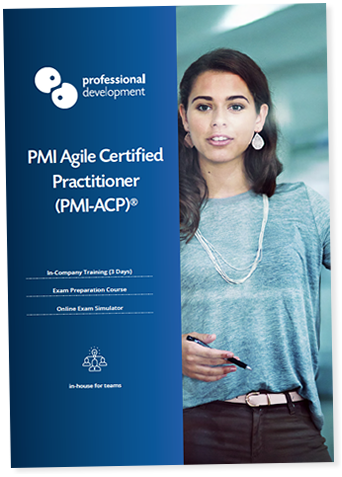 Our approach to delivering PMI-ACP® exam prep as an in-company programme enables you to focus on providing your team with elements of practical agile training, along with intensive exam preparation. What are the Benefits of Running PMI-ACP® Exam Prep for my Company? We cover agile processes and principles that are relevant and applicable to any agile-suited project. This means that your team will be able to adapt their agile toolkit to fit whatever project they work on. When planning and tailoring the course for your business, we will consult with you about any challenges, processes, or goals particular to your industry or organisation. As a Registered Education Provider (R.E.P. )® with the Project Management Institute (PMI)®, we are committed to providing the highest standard of support and guidance in exam preparation. If you have any Project Management Professional (PMP)® credential holders in your organisation, the PMI-ACP® exam prep training is an excellent way for them to progress and expand their skill-set. It is also eligible for 35 PDUs, which will enable them to easily maintain their PMP® credential, while enhancing their project management capabilities. What is covered on this PMI-ACP® Exam Prep Course? Who is this PMI-ACP® Certification Designed for? PMI-ACP® certification is suited to project managers who have experience using general project management methodologies, and with agile or iterative approaches to project management. You’ll find full details about the PMI-ACP® eligibility requirements in our brochure. However, it can be helpful to speak with our training consultants when assessing the right training choice for a team. Contact us, either by clicking below to ask a question, filling in the “Get In-Company Quote” button above or by calling us on Freephone 1800 910 810. Is this course designed for IT companies? This course is suitable for organisations of all sizes, in every sector. Although agile originated and is still widely used in the IT sector, it is now applied in almost every business sector worldwide. I’m unsure about my team’s suitability for this course. They are new to agile, but have lots of general project management experience. How will I know if they are eligible to sit the PMI-ACP® Exam? If you’re hoping to run this programme for a group of experienced project managers who are new to agile, they may already meet the eligibility requirements through working with iterative or progressive elaboration project management methodologies. Your best course of action is to get in touch with one of our training consultants by calling us Freephone on 1800 910 810. We will talk you through the requirements, and help you assess if PMI-ACP® exam prep is the right fit for your business. What is the process for booking in-company training? Our in-company training format is highly flexible. It centres around your priorities and schedule. Begin by contacting us to request an in-company quotation. We will discuss your needs and answer any questions you may have at this stage. We then create a customised solution for your training programme. Once you have confirmed your booking, we will schedule dates that work best for you. Our trainer will come to your premises or a location you choose to deliver training for your team. I am seeking to attend this course as an individual. Are there any public courses available? Our PMI-ACP® Exam Prep Course is currently only available for in-company bookings. However, if you are seeking to attend public agile training that leads to international certification, our Agile Certified Course may be an excellent fit for your needs.